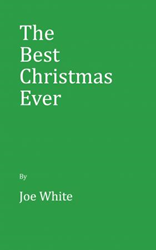 Within the pages of Joe White’s book, "The Best Christmas Ever" ($14.49, paperback, 9781545630471; $24.99, hardcover, 9781545633250; $6.99, e-book, 9781545630488), readers—young and old—are reminded of the magic and mystery of Christmas. Through this book, readers get a glimpse of the author’s life journey of family and relationships through each Christmas. The Best Christmas Ever shows us how Christmas and our lives change and grow, along with the overwhelming feelings of joy and hope the season brings each year. Joe White was born in Rockwood, Tennessee and grew up on the outskirts of Chattanooga, Tennessee. He was the youngest in a family of six. He earned a Bachelor of Science degree from the University of Tennessee in Knoxville. Xulon Press, a division of Salem Media Group, is the world’s largest Christian self-publisher, with more than 12,000 titles published to date. The Best Christmas Ever is available online through xulonpress.com/bookstore, amazon.com, and barnesandnoble.com.